I have to confess, when I started trying to make my routine a bit more natural there was one beauty product I really dragged my feet on switching - my nail routine. Up until that point I had accrued quite the collection of Essie polishes, a collection which seemingly grew from each visit to my local drugstore. I've always been a bit of a polish addict so I think part of me was afraid that a more natural formula wouldn't work quite as well. Well as it turns out, all I needed to wean myself off of drugstore polishes was a really great natural polish brand, which I found in the fabulous Treat Collection. 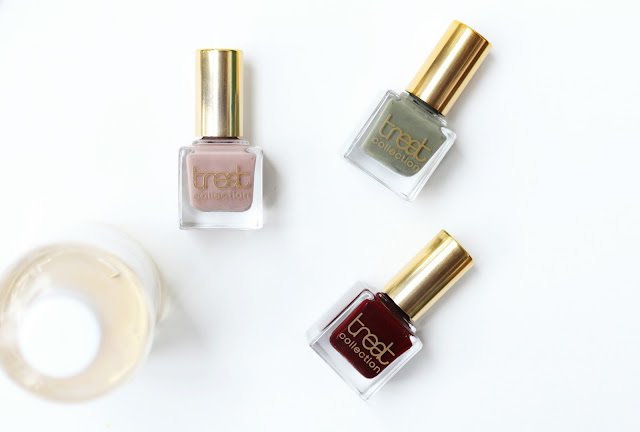 Not only are these polishes ridiculously gorgeous to look at but the 5-free formula performs fantastically, dries fast and lasts for much longer then any drugstore competitor. I've been testing out three shades from the brand that have all been in constant rotation for me this past month. Delicious* is a sheer grayish brown that, though labeled as sheer, I found could easily become opaque after two coat. Street Chic* is a khaki green hue that has probably been my most worn shade (I'm wearing it as I type this). It becomes completely opaque for me after two coats and works well as the perfectly unexpected fall neutral. Finally there's Drama Queen* which is described by the brand as a "high impact Oxblood hue", a description I don't think I could really improve on. When I'm looking to add a real pop of drama to my look this is what I turn to. It's a completely wearable shade of red that doesn't make me look like a toddler playing dress up, and unfortunately common occurrence for me when wearing shades of red. I've also been trying out the brand's Natural and Gentle Nail Polish Remover*, and after just one use I tossed my regular polish remover in the garbage because it is that good. This formula forgoes acetone and is instead enriched with vitamins A, C and E, as well as argan oil and soy, to promote healthy, stronger nails. The blend of oils makes this a really hydrating liquid, so it never leaves your nails or skin with that dehydrated feeling that a normal polish remover would. All that good stuff aside though, when it comes to actually removing polish this stuff does ridiculously well. I first used it to remove a deep navy hued polish from my nails, a task I fully expected it wouldn't be up for. Instead it removed every last speck of polish with just two swipes, no hard scrubbing required. It's pretty powerful stuff and I honestly would recommend it to anyone, whether you're switching to green beauty or not. It far outperforms regular polish remover in terms of how quickly it gets rid of color, but it also leaves your nails in tip-top shape. Definitely a winner in my book. All in all it's safe to say I am officially a natural polish convert, and the credit for that really goes to Treat Collection. These gorgeous little bottles not only look amazing on my vanity but perform exceptionally well. I didn't think anything in the world could get me to throw out my Essie collection, but this brand has done just that. These are some gorgeous colors!! My fave has to be the khaki green too!! Also I need to pick up that polish remover!! It sounds amazing!! I use acetone and I hate the way it leaves my nails! That nail polish remover sounds amazing! I hate how dry my fingers feel after using my normal nailpolish remover so this might be just what I need!